Atlas 89'4" All-purpose flatcar ACF prototype All purpose flatcar. First built in the 1960s. Still in service today Prototype specific details will be applied (number of hitches, and container pedestals) From the pre-production sample I saw, it appears the container pedestals will be removable. 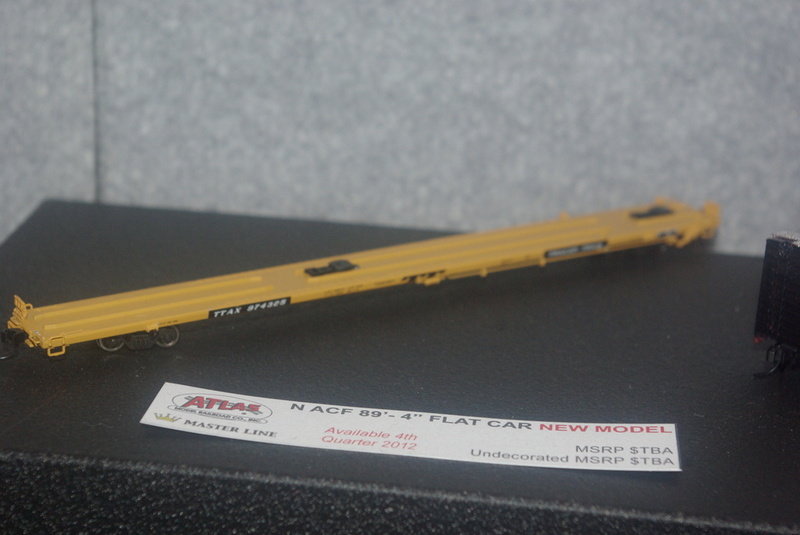 AC Models 89 foot smooth side flat cars TTX 89'4" all purpose flatcars These come in kits of two cars (so that either a single triple 53ft car can be built, or so that a pair of individual flatcars can be made. The two pack can be made up of one of each, or two of one kind. 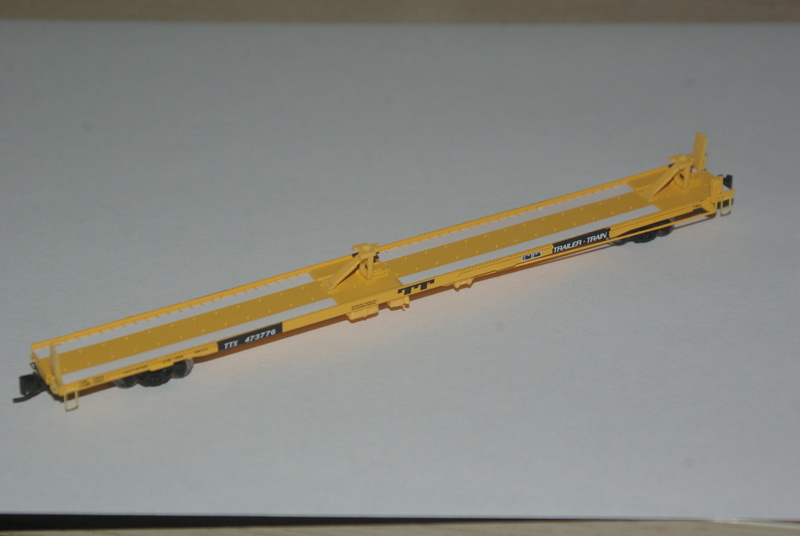 AC Models 89 foot Channel side flat cars TTX 89'4" all purpose flatcars These come in kits of two cars (so that either a single triple 53ft car can be built, or so that a pair of individual flatcars can be made. The two pack can be made up of one of each, or two of one kind. 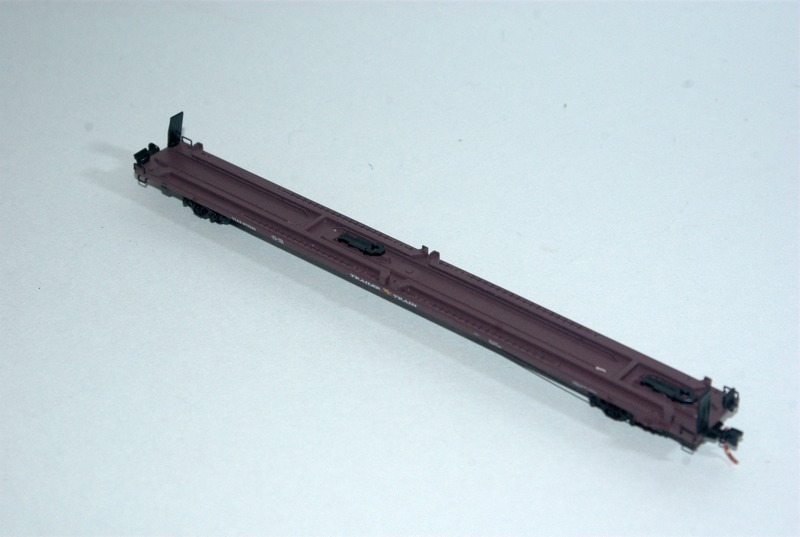 AC Models 89 foot Z sill flat cars TTX 89'4" all purpose flatcars These cars are sold as cast metal kits. AC Models two unit triple 57 cars. TTX cars with TTEX or RTTX reporting marks These come in kits of two cars. In this set, one car has a flared end as some of the triple57 cars have. 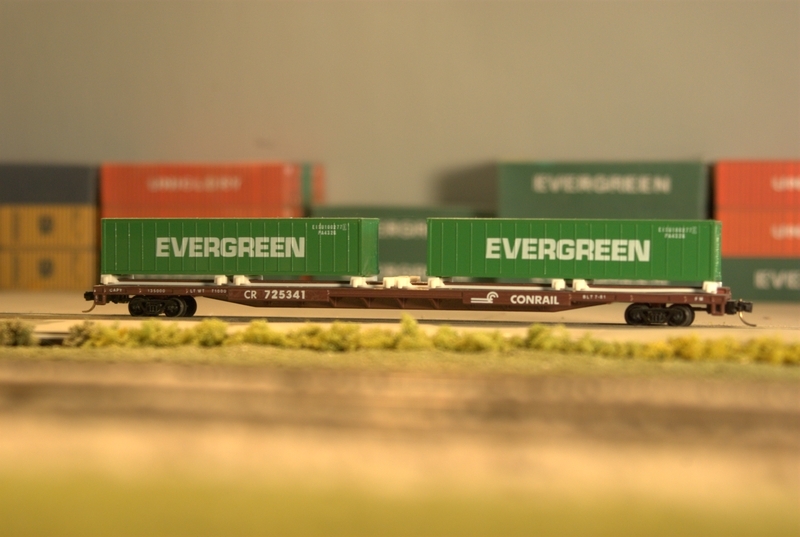 Micro Trains Line 89'4" foot Container flats ACF All purpose flatcars (introduced in the late 1960s) Available individually, and with a one or two 40' containers, or 4 20' containers. N-Scale Kits Clejan Intermodal Flat Car Clejan cars were used with special trailers in the late 1950s and 1960s. They were designed to reduce tare (empty) weight, and resemble spine cars in many ways. The cars come as a cast metal and etched brass kit. N-Scale Kits 89 foot smooth side flat cars TTX 89'4" all purpose flatcars These come in kits of two cars (so that either a single triple 53ft car can be built, or so that a pair of individual flatcars can be made. The two pack can be made up of one of each, or two of one kind. This is a former AC Models kit. N-Scale Kits 89 foot Channel side flat cars TTX 89'4" all purpose flatcars These come in kits of two cars (so that either a single triple 53ft car can be built, or so that a pair of individual flatcars can be made. The two pack can be made up of one of each, or two of one kind. This is a former AC Models kit. 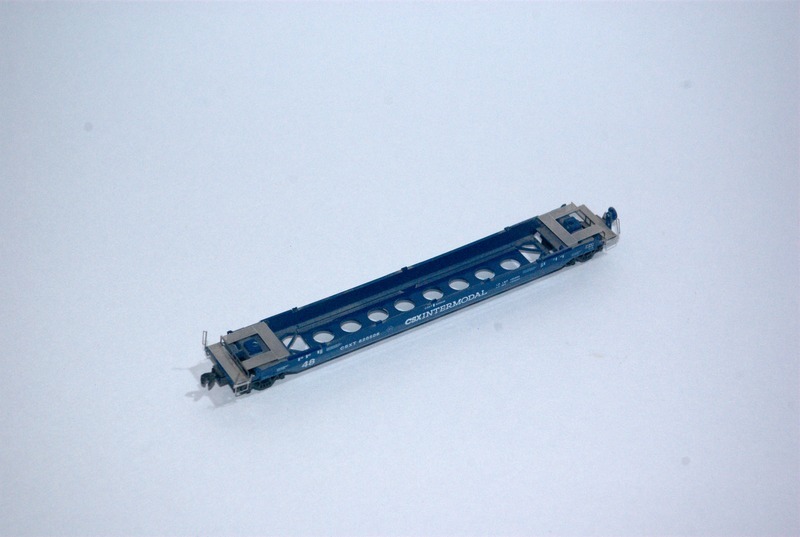 N-Scale Kits 89 foot Z sill flat cars TTX 89'4" all purpose flatcars These cars are sold as cast metal kits. N-Scale Kits two unit triple 57 cars. TTX cars with TTEX or RTTX reporting marks These come in kits of two cars. In this set, one car has a flared end as some of the triple57 cars have.This is a former AC Models kit. N-Scale-Kits PRR F30D TOFC Flatcar PRR Class F30 flatcars rebuilt to handle TOFC trailers for the PRR TrucTrain Service. Cars were later donated to the Trailer Train equipment pool. Cast metal kit with laser cut wood decks. This is a former AC Models kit. Ultimate N Scale Early Piggyback Flatcar Conversions Cast resin kits for 50 foot Atlas flatcars. I own one of these kits, which is a southern pacific prototype, but may be applicable to other roads as well. AC Models 48 foot All Purpose Spine Car TTX 48' All purpose Spine cars. Cars have TTAX Reporting Marks This Car is sold as a cast metal kit Designed to hold a single level of 20,40, or 45 foot containers or up to 48 foot trailers. AC Models 53 foot All Purpose Spine Car TTX 53' All purpose spine cars. Cars have TTAX reporting marks This model is sold as a cast metal and etched brass kit. Designed to hold a single level of 20,40,45, or 48 foot containers or up to 53 foot trailers. Interail Front Runner I'm not sure if this car was ever produced, but I have an N-Trak Newsletter from July/August 1993 that indicates this was in the works. Deluxe Innovations/GHQ 53ft all purpose spine car This car has yet to be released. Just announced at the National Model and Hobby Show. My understanding is that GHQ will be producing the cars, and Deluxe will be decorating and selling them. The report is that these cars will be cast Pewter, so they should have sufficient weight to track very well. N-Scale Kits 48 foot All Purpose Spine Car TTX 48' All purpose Spine cars. Cars have TTAX Reporting Marks This Car is sold as a cast metal kit. This is a former AC Models kit. Designed to hold a single level of 20,40, or 45 foot containers or up to 48 foot trailers. N-Scale Kits 53 foot All Purpose Spine Car TTX 53' All purpose spine cars. Cars have TTAX reporting marks This model is sold as a cast metal and etched brass kit. This is a former AC Models Kit Designed to hold a single level of 20,40,45, or 48 foot containers or up to 53 foot trailers. N-Scale Kits Two Unit Trash Spine car This is a two unit car used to haul trash containers. This model is sold as a cast metal kit. Typically the cars are loaded with three containers on each platform, two on the coupler end and one on the articulated end. AC Models 40 foot well Rebuilt Gunderson Maxi-Stack III 5 Unit articulated car. Sold as a cast metal kit kit Represents a car rebuilt by TTX from a 48 foot well Gunderson Maxi-Stack III. Deluxe Innovations 40 foot well Thrall Low Pack 2000 Thrall Low Pack 2000 Articulated Cars. These cars are a ready to run version of the Interail kits, and are based upon the same tooling. Deluxe Innovations 48 foot well Gunderson Maxi Stack III Gunderson Maxi Stack III 5 Unit Articulated Cars, cast metal construction. Deluxe Innovations 53 foot well Gunderson Maxi Stack IV Gunderson Maxi Stack IV 3 Unit Articulated Cars, cast metal construction. Interail 40 foot well Trall Low Pack 2000 Thrall Low Pack 2000 Articulated Cars, and cars with generators for refrigerated containers. Sold as a cast metal and etched brass kit The molds for this kit now belong to Deluxe Innovations. N-Scale Kits 48 foot well Gunderson Husky Stack Single Cars. Sold as cast metal kit This is a former AC Models kit. N-Scale Kits 48 foot well Gunderson Maxi-Stack III 5 Unit articulated car. Sold as a cast metal kit kit This is a former AC Models kit. N-Scale Kits 40 foot well Rebuilt Gunderson Maxi-Stack III 5 Unit articulated car. Sold as a cast metal kit kit Represents a car rebuilt by TTX from a 48 foot well Gunderson Maxi-Stack III. This is a former AC Models kit. N-Scale Kits 48 foot well National Steel Car All Purpose Well Car 3 Unit articulated car. Sold as a cast metal kit This is a former AC Models kit. Gold Metal Models Etched brass walkways for double stack cars made by ConCor, Roundhouse, and Walthers. 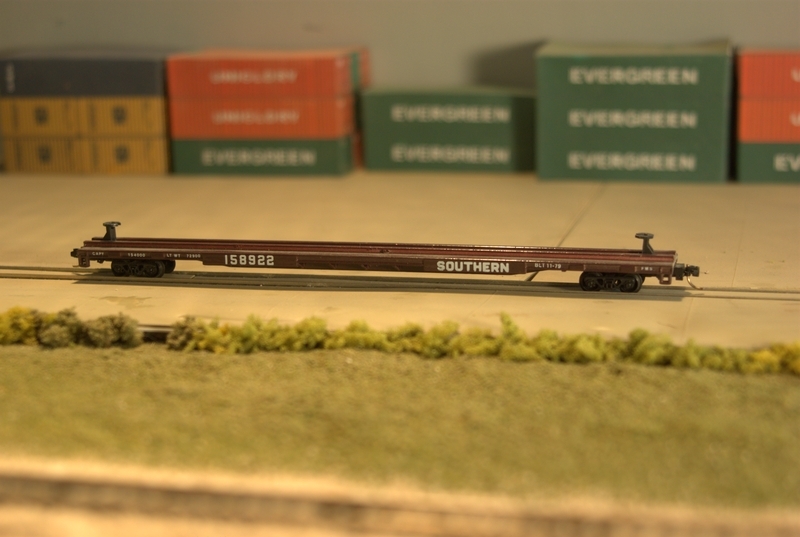 These are also used with some of the Fine-N-Scale double stack cars. N Scale of Nevada Articulated joint modification for Interail's Thrall Lo Pack 2000 double stackcars. This page has been created and maintained with pico and vi.